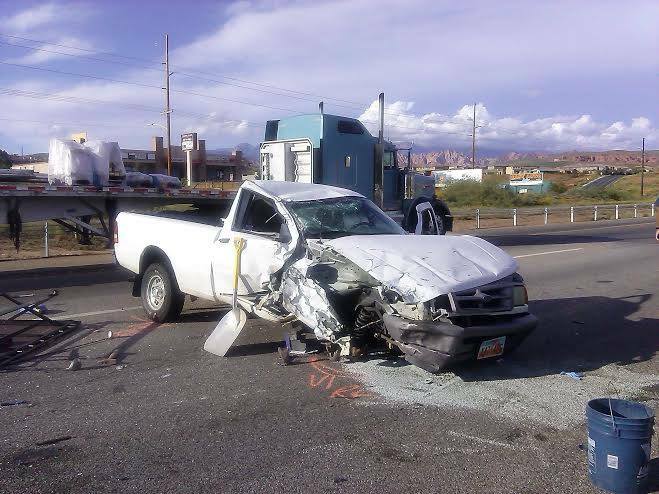 WASHINGTON CITY – Two accidents occurred back to back Saturday afternoon on northbound Interstate 15 at mile marker 11, 1 mile north of the Washington City exit, after a red truck cut off two vehicles. Just before 5 p.m., a woman driving a blue car and a woman driving a white SUV were traveling northbound on I-15 behind a motorhome. As the car and SUV neared mile marker 11, a red truck came up too quickly behind the motorhome and cut the two vehicles off, Utah Highway Patrol Sgt. Danny Ferguson said. 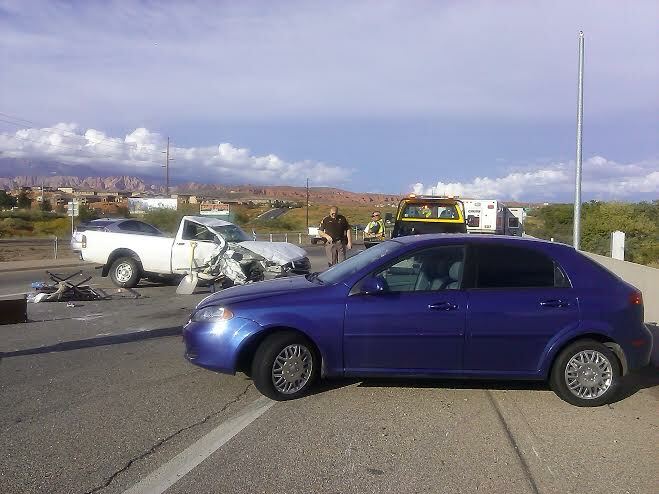 The blue car and the SUV spun out across the slow lane and came to rest on the right side of the road. The red truck continued traveling northbound, and an attempt to locate has been sent out, Ferguson said. 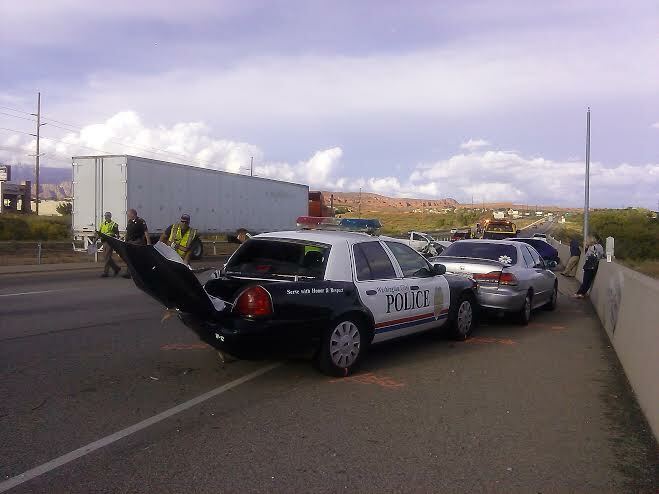 The driver of the blue car, Brooklyn Barton, of Kanab, said the red truck came up and bumped into her. A blue van and a silver Honda pulled off the road to see if they could render aid to the passengers of the vehicles involved in the accident, followed by a Washington City Police officer who was in close proximity to the accident. The police officer had just gotten out of his patrol car when, within seconds, a white truck driven by a man came up and rear-ended the patrol car, bumping it forward into the silver Honda, Ferguson said. “It was a good thing the officer was out of the car,” Ferguson said. The white truck flipped over the top of the patrol car and continued to roll, landing on its wheels in the center of the two lanes facing oncoming traffic. The man driving the white truck said he entered the freeway and saw the police car but it didn’t click that the police car was stopped, Ferguson said. He looked right to merge into the left lane and, as he looked back, he was already crashing into the police car, he said. Both lanes of northbound traffic were blocked as a result of the accidents and northbound travel was diverted to one lane, which went off to the left side of the left lane. At 6:30 p.m., an hour-and-a-half later, both northbound lanes and the Green Springs Drive freeway on-ramp were reopened. 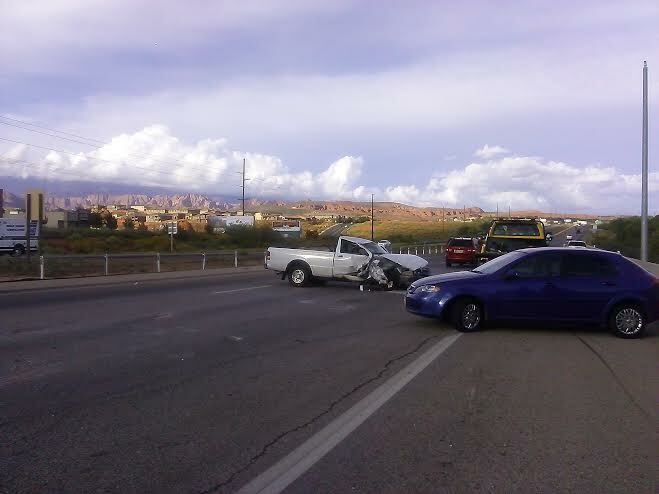 The woman driving the SUV was transported by ambulance to Dixie Regional Medical Center. The white SUV, white truck and the Washington City Police car had to be towed. Never thought we’d see bobber at a loss for words…..
How much more can you say about these idiot drivers? I’m constantly amazed at how few Americans carry flares with them, and don’t even know how to use them if you stop and give them some. This should be a basic requirement of driver’s training and automobile safety inspection. I’ve been wondering how many and how bad people were hurt…this was a best case scenario it seems. Can you publish more on the missing truck? because the truck driver doesn’t have in insurance and neither does the police car….or is that the only thing your commenting fingers could type at the moment. It didn’t click that the police car was stopped. WOW stupid is rampant! I’ve lived a lot of places but never anyplace where the driving was worse than it is here. This accident could have happened to any of us anytime…just driving on Bluff or Sunset is a “thrilling adventure” with idiots dodging in and out, running up too close behind, and driving as if this is the salt flats and not city streets. What’s the deal here? I lived in Spring Hill, FL years ago and US-19 was horrible. The State did a study as to why the road had on average 4 accidents a day. They concluded it was because of a mix of retiree’s and working folks. There are a lot of retiree’s per capita there and the conclusion was they drive slower, they’re not in any hurry, causing younger folks to drive more aggressively to get by them, past them, or get out before them. Once a driver becomes aggressive, the aggressiveness continues to increase and it causes others to become aggressive, that aggressiveness also increases and so on. We have the same basic demographic here. There isn’t the same population, but I bet it’s very close per capita. They solved some of the problem in FL by the police doing aggressive driver blitzes. They stopped everyone who pushed it and also the ones that were to slow, within a year we saw a big difference. I’m not saying anything against the police in this accident. I just wonder why they stopped dropping flares at accidents. A few years back when a cop pulled up to an accident that covered more than one lane, they would drop a few flares to alert vehicles. People get used to seeing flashing lights on the side of freeways and one cruiser can’t cover 2 or 3 lanes of stopped vehicles, that’s where the flares came in. It probably wouldn’t have helped in this case when someone just doesn’t pay attention, but we never know, it may have. They still do. But in this case it reads the officer just arrived and had gotten out of his car. I think the police officer should have been given a citation for not properly parking his cruiser. Whats the proper way to park a cruiser behind an wreck, Or do you know it wasn’t because of you unlimited weath of knowledge. Anyone else notice how the worst drivers on the road are guys in these big full size lifted pickup trucks. Who wants to bet the “red truck” was a dodge ram? Dodge and ram kinda describes the whole cluster … don’t it Bobber? People driving too fast and not paying attention. The cops aren’t much better as they park their cars halfway in traffic and half out. Road flares, I haven’t seen one of those for a hundred years. 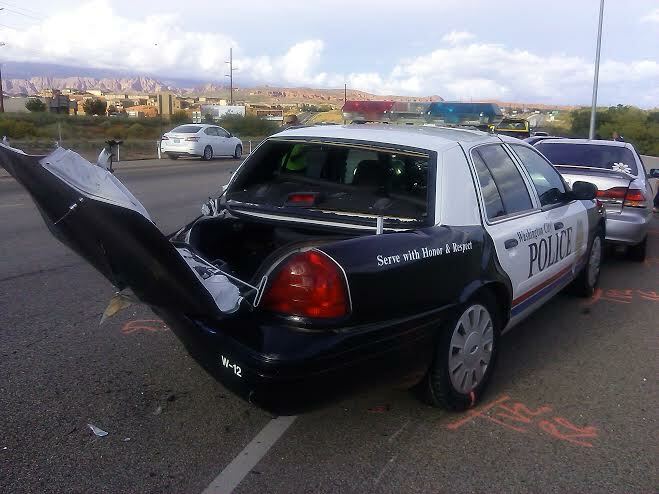 Did the officer have his Federal Light Bar turned on. I appears from the photo it was not. So when the driver of the white truck assumed he was moving, does this bring more to the table. And we can play arm chair cops and but we weren’t there, and we are in danger of been seen as idiots, because of our comments. So I will say no more. I know the driver of the white truck, I’m just happy he is OK and no one else receive major injuries. I think all the hostilities should be directed at the red truck not the others who suffered the consequences of his actions. We were right behind the white truck. We both were coming up the onramp and both could see the accident on side of road. Police did have the lights on. We watched the white truck hit the cruiser head on and then fly up and roll three times before landing. Debris was everywhere. The policeman was just about 15 yards from his car. Luckily he was not hit, nor the other rescue teams. Maybe people need to not look at their phone when driving ! I wonder if the officer cited himself for following to close. Probably not because he was stopped and out of the car on a accident. May be SGNews can do audio of these story’s so you can understand.